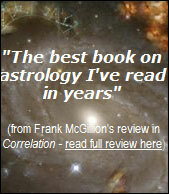 Intelligent, informed discussion of astrology: this is the companion site to the book Astrology in the Year Zero. I whole-heartedly recommend the DVDs of scanned texts that Philip has made available. You'll find full details in the following PDFs. Both contain the same information, but the former is a large file (6mb) with good quality images, the latter is fairly small (600k) with moderate quality images. Astronomy pages - text by Nick Kollerstrom, with material by John Martineau. Words and images presenting insights into the bodies, and geometrical relationships, of the bodies in the Solar System. This fascinating study brings together original, thoughtful enquiry and research into Mesopotamian artefacts. It was Chris's dissertation for the MA programme at the Sophia Centre. A lot of us will find this site interesting, both for the insight it affords into recent developments in the world of UK academic astrology, and for the various downloadable docs, and videos, that it features (including such luminaries as: Bird, Cornelius, Curry, Greenbaum, Hyde, Shaw, Voss). Btw - the videos are somewhat hidden, you'll find the link on the 'Publications and Recordings' page - search for 'watch a selection of videos'. If you have ever looked at some astrological pattern, wondered, 'what are the odds of that? ', and wished you could ask a statistician, here is an opportunity to do just that by emailing your question to Kyle Pierce c/o the contact link at the top of this page. The starter document that is currently posted here is just two pages long, but it is open-ended and the plan is that Kyle's answers to at least some questions will be added in the months to come. These two papers - Simply the World and The Outside Lands - present reflections on the nature of astrology, based on a poetic/philosophical perspective. Alie's PhD thesis: this thought-provoking work looks at astrology's return to academia and provides an intellectual framework which facilitates discussion of the issues arising from that relationship. This is simply essential reading for anyone with an interest in astrology's place in the Western world. Follow the link above for a list of around 287 astrological texts assembled by Patrice Guinard. A huge and impressive collection, and all power to Patrice for putting it together. Follow the above link for thoughts on the Dawkins experience from the Observer's astrologer Neil Spencer. The Sophia Centre is re-establishing itself as a distance-learning centre based at Lampeter University. Follow the link above for more information. Recent developments in science – particularly quantum theory – have been taken by some astrologers to herald a paradigm shift which would make it possible to validate and explain astrology as a science. The suggestion is made that this case is currently unconvincing. Instead, it is argued, modern science's contribution to the understanding of astrology is more relevant to astrology as a divinatory art than as a hard science. In this paper, originally written for the MA program at Bath Spa University, Judy advances a case for considering that the idea of a 'chain of being' should be traced, not to the Greece of Plato et al, but rather to the earlier civilisation of Mesopotamia; and that the influence of this idea may also be preserved in the Kabbalah's tree of life. What are the facts behind the International Astronomers Union's demotion of Pluto to the status of a dwarf planet, and what should astrologers make of the furore surrounding the decision? Nick presents a punchy overview of the episode, allowing space to astronomical and astrological perspectives. A new interview with David has just been posted on the homepage of Cosmic Patterns Software. Lots of interesting material on statistics in astrology, Kepler College and software, and much more. A short introduction to Paul and his fascinating new book on progressed synastry - on the Positive Astrology website. This is version 2 of Kirk's study of the way the divinatory view of astrology has evolved in recent years, with particular focus on the work of Geoffrey Cornelius. This new edition (issued 31 March 2006) incorporates a huge number of refinements and clarifications, plus a lot (over 33%) of new material. On the download page you will find an introductory epistle from Kirk which explains more. Essential reading. Originally recorded for, and featured in, Year Zero; now available in its complete form for the first time, on the Skyscript site. A concise and lively account of the seeming demise, and resurrection, of the Gauquelin work. One of Garry's more recent interviews - including reflection on speculative astronomical bodies and the relationship of religion to astrology - is now available on the Skyscript site. Recommended. Nick Kollerstrom has quietly been publishing a huge body of work on the web. It ranges from the history of astronomy, to alchemy and astrology's relationship to metals, to horticulture and Moon cycles. For the first time, here are all the links collected together in one place. An inquiry into the phrase 'as above, so below', which asks whether it is valid to trace its ancestry back to ancient Egypt. Provides the reader with a fascinating and thoroughly-documented exploration of Egyptian culture, with a number of illustrations. Did Newton actually say "I, sir, have studied the matter; you have not" when someone criticised astrology? The truth about this popular story, and about broader issues concerning Newton's views about the world, presented by James in this thoroughly-researched and closely-argued paper. An innovative study which applies Sheldrake's concept of morphic fields to humanity's discovery and evaluation of Uranus. This paper comes from Faye's work on the MA course at Bath Spa University College. Garry Phillipson: Whatever Became of Him? Garry is currently working on a PhD about astrology at the University of Wales, Lampeter. His thesis will pursue some issues raised in Astrology in the Year Zero - but don't hold your breath, the current schedule doesn't see it being completed until July 2013. For some links to universities which now offer courses in astrology, follow the link to 'Astrology & Academia' on the left of this page.